I used to lift weights and body build back in 2005 – 2007. I gave it a break so I could heal emotionally, but I realized sometimes the 2 can go hand in hand. When I got out of the hospital a couple of months ago, I decided to bring it back into my life slowly, and now I am heading into a whole new routine that is going to be painful, yet healing. 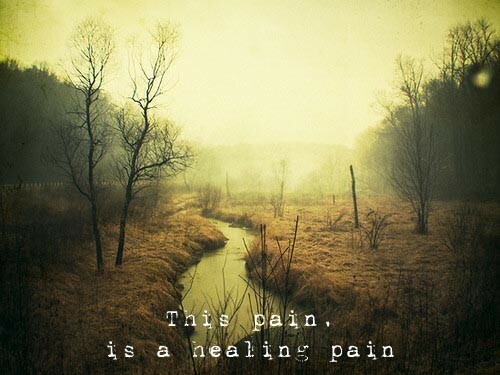 Not only healing for my body, but healing for my soul as well – like the photo says “this pain is a healing pain”. A lot of people know that I am at my happiest when I am fit both physically and connected emotionally, but what I have come to realize over time is that, healing = pain, and pain = healing – both emotionally and physically. I can be disconnected and connected at the same time, I can feel hurt and know its good pain. Last night I did 250 up crunches and today I can barely sit without being in pain, but I know that it’s the muscles way of healing into a better shape, and I need to feed it protein and lots of water to recover. This past weekend I had a trigger happen to me, and it was a hard big trigger; one that left me into a whirlwind of emotions that I didn’t even know were there, and although it was so scary and hard to go through it, the result was being able to talk about it with my therapist, and realizing the feelings behind the trigger is what’s healing, not the action itself. No it wasn’t fun to go through that horrible trigger, but it served a purpose for emotions to be paid attention to – the body’s way of saying “hey, this is something you need to honor to heal from this”. During the trigger I realized I could reach out to all my support, and each one would be there, and they were. My husband helped me through it, my good friend Amie took me out for coffee and we had a nice talk, my therapist sent me a text and email with assurance that connection was here, and sent me loads of goodness. God was present in my heart as he always is, and although it was a very bad trigger, I still found that it was healing for a reason. Today in session we talked about it, and I had tears again just thinking about the trigger, he kind of brought me back to talking about the trigger, and it was hard, but it was good, because I felt it was healing to let it go and have someone hear what was behind the trigger for me. The same thing with working out – I know I have a heavy routine coming up in the next month.. I am switching to something I have never done before – CROSS TRAINING! 2-4 hours of grueling workouts with a trainer, but I know that the pain I endure during this intense training, will come healing for my body the way I want it to be, and for my soul. When I used to train with Jose Sanchez back in 2007, there was this ONE machine I would workout on that would always make me cry, not because it was hard physically, but for some reason this machine brought out emotions in me. It was a Leg Press machine, it’s the one machine that works out the largest muscle in your body, and it brought out emotions in me everytime! It was the soul getting a workout as well! Healing = pain = healing .. I truly believe that today! NO I didn’t think about that while I was in the trigger, all I wanted was to get out of the trigger and feel better, but I realized after that for some reason, that trigger had a purpose for something that needed an escape, and it did, and I reached out during the trigger which is so SO new for me. Tomorrow night I have my first physical training session with one of the body builders, and he said “be prepared Karen, I am going to give you the workout of your life”.. I chuckled but BOY do I remember those days! pain, but good pain! I am looking forward to this new training regimen, and I am also looking forward to how this new “physical” training will enhance my “emotional” training with my therapist as well – new things to come and I am truly looking forward to it – pain and all. Next postand so it begins . . .